Bear & Company, 9781591433385, 176pp. The Akashic Records are a vast domain of energetic imprints much like a movie library, a living vibrational field that stores all possible futures, the present, and the past. As soon as your soul begins its life experience, a field of energy is released that records every thought, word, action, desire, and emotion. 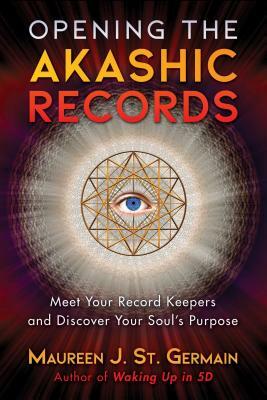 In this guide to opening the Akashic Records, Maureen St. Germain provides precise instructions explaining how to connect with your personal Record Keepers, gain clear access to the Akashic Records, discover information about you and your loved ones, and learn your soul’s purpose. The author explains how outside energies can influence your connection to the Akashic Records. She details energetic clearing exercises to remove the energies blocking or shadowing your access and teaches the Higher Self Protocol to ensure an authentic channel of communication. She explores how to find the Record Keepers who will be the most helpful to you and provides techniques and tools, such as guided energy work, to prepare you for Akashic Record access, initiate you into the 5D mindset, and invite more accuracy and a stronger connection. She details the specific markers to look for to recognize genuine Akashic Librarians and to validate and confirm the information you receive, rather than simply “trusting” it to be true. She also provides guidance on accessing the Akashic Records on behalf of other people, how to ask questions, and how to handle the information as it comes in. Explaining why the Ascended Masters opened access to the Akashic Records to all of humanity and how their presence assists you, St. Germain shows how the intended purpose for working with the Akashic Records is for soul growth, not to “repair” your karma debts. By seeing your records and working with your Record Keepers, not only will you learn your soul’s purpose and help solve the problems that crop up in everyday life and relationships, but you will amplify your spirituality and begin operating at a higher level in consciousness. Your work in the Akashic Records aids and assists in Earth’s ascension. Maureen J. St. Germain is the founder of Transformational Enterprises and has led trainings in personal development and spiritual awakening in more than 24 countries. The founder of Akashic Records Guides International, she is also the author, musician, and producer of more than 15 guided-meditation CDs. An internationally recognized teacher and intuitive, she is the author of 3 books and lives in San Diego and New York.